Product #16270 | SKU XF200 | 0.0 (no ratings yet) Thanks for your rating! 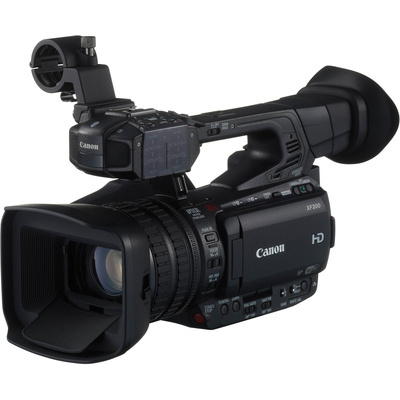 The camera records MPEG-2 at frame rates of 23.98/29.97p and 59.94i at up to 50Mbps, with 4:2:2 colour sampling, to integrated CF card slots using an MXF wrapper that is compatible with most popular NLE systems. You can also record to an integrated SDXC card slot using the MP4 codec at frame rates up to 59.94P. The XF200 features 4-channels of audio with manual/automatic record levels with two XLR inputs and a built-in on camera microphone. The built-in hand grip features 120° of rotation, making it easier to find a comfortable shooting position. The XF200 features a 1/2.84-inch HD CMOS Image Sensor that is slightly larger than a 1/3" sensor. The sensor features approximately 5% more pixels than 1920 x 1080 and records a 1920 x 1080 window from the slightly large sensor. This allows the camera to use the extra pixels for Electronic Image Stabilisation and maintain the 1920 x 1080 resolution so the image isn't degraded by being blown up as with traditional EIS systems. The XF200 offers optical image stabilisation (OIS) useful for reducing image blur in a wide variety of shooting situations. It also utilises electronic image stabilisation (EIS) in conjunction with the OIS providing 5-Axis image stabilisation. The 3.5" Organic Light-Emitting Diode (OLED) display provides vivid colour and 1.23MP resolution. The viewscreen has a viewing angle of over 80 degrees in all directions, which allows you to see a usable image even when you are off angle to the viewscreen. The Colour EVF is a 0.45 inch with 1.23MP of resolution and tilts up to 45° to accommodate different shooting positions. The XF200 features an integrated mic and 2 XLR Line/Mic level inputs with +48V phantom power for connecting external mics. The camera features an HDMI output connector. Relay recording: the XF200 automatically switches video recording from one memory card to the other when the first memory card becomes full. USB: An integrated Ethernet port allows you to link your camera to existing wired networks and wireless routers allowing you to download footage from the memory cards. Autofocus: The camera features an autofocus system with several useful modes, including Instant AF, which uses both the TTL-Video Signal Detection System and the external sensor, and Face Detection AF, which tracks the focus on faces in the video frame. Wide Dynamic Range: Wide Dynamic Range Gamma of 600% helps prevent overexposure, even for high brightness areas of an image and/or with non-uniform colours. Unlike the normal knee function that compresses video signals in high brightness areas using linear gamma, a wide DR Gamma retains continuity across the image and enables colour grading.